Imagine it’s your first day at a new job. Typically, you spend the day filling out paperwork, meeting your team, navigating around the office and trying to locate your desk. At Zendesk, we like to do things a little differently. We still make sure you accomplish the essentials but on Day One, our new Zendeskians head out in the community and volunteer! That is exactly what brought our new hires in Melbourne to Purple Lion at their Little Learners Centre last December. Purple Lion is a non-profit organization that supports quality education and development of children with autism. Due to funding, Purple Lion focus on creating a lot of the resources onsite in order to ensure all extra funds are being put towards the care of their students. These types of tasks are quite time consuming and therefore become less of a priority and are often done after hours by the staff. Our eager group of new hires joined the Purple Lion staff in North Melbourne to help the teachers with these tasks and more. They jumped right in, helping cut and laminate artwork for projects for the Little Learners Program, decorating the building for the holidays, construct new furniture and beautify two areas with themed wall décor. We also must extend a special thank you to the teachers at Purple Lion who were so accommodating to our group. Being active in our community is a core part what makes Zendesk, Zendesk. 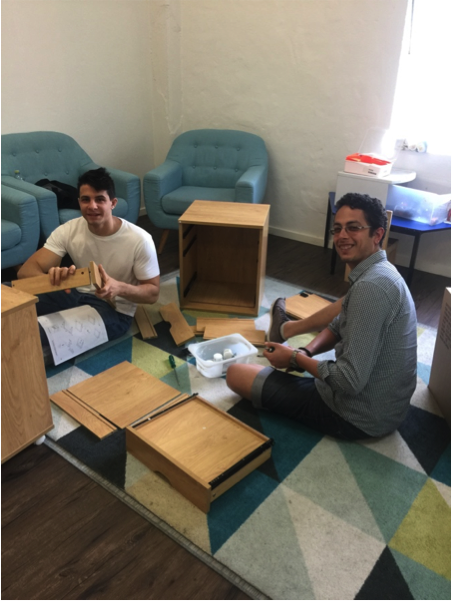 New employees go volunteering at the beginning of their career at Zendesk to understand the importance of being a part of our neighborhood as well as bond together as new Zendeskians. It’s our way of saying, welcome to the team!